1. Installation of Office 2007 Data Connectivity Components or Office 2010 Database Engine on the Server. 3. In project, Change Platform target from: Any CPU to x86 and Rebuild it. What would happen if you have shared hosting or Azure Website hosting and You are not allowed to install ACE Database engine on the server? 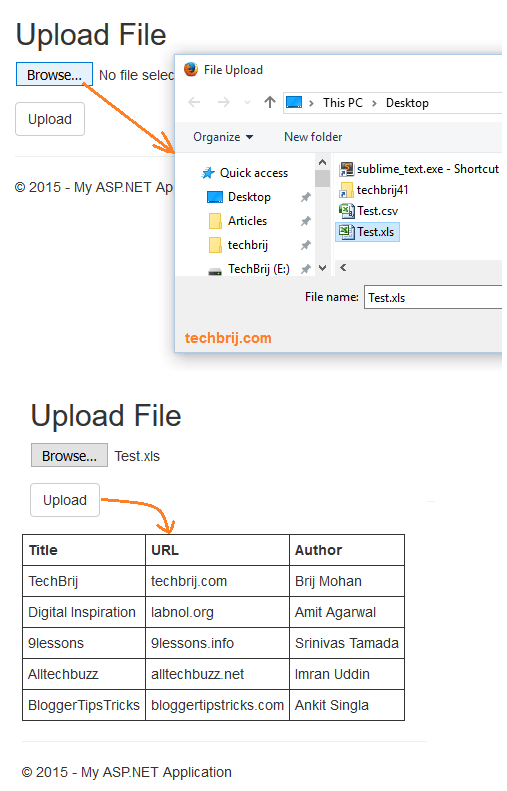 In this post, we will see how to upload and read both .xls and .xlsx excel files without any server dependencies in ASP.NET MVC. We will use ExcelDataReader, an Open Source project to read excel files. We will read excel, get data in DataTable and show DataTable in View. It is assumed the file will have column names in first row. ExcelDataReader has no dependencies on external database engines which may not be available on a remote server. It is helpful to deploy application to Windows Azure Websites, Shared hosting or any other machine where the ACE Database engine is not available. We have seen how easy to read excel sheets in ASP.NET MVC with ExcelDataReader. Hope It helps. Feel free to share your opinion in comment box. Thank you for this great example !. But I have a question. Is it possible to after read the excel file that the code is changed in a way that he can also read data from each cell from the spreadsheet and then save this data in a text file or database? If possible how we could do this ? If you are using ExcelDataReader 3+ you will find that there isn’t any method for AsDataSet() for your reader object, You need also to install another package for ExcelReader.DataSet, then you can use AsDataSet() method. Hi great work sir, can you help me this i want uploaded .xls file save in databse table with prorper cloumns entry in table. Hi, How to use excel sheet with extension .csv? I tried the Same code in view if (Model != null) , Model is getting Null , I Have use the namespace of Datatable Though Model is getting null . Any reason ?? Thank you Sir. It worked great!!! !